To make the 120 calorie "crafted with less sugar" magic happen, they act as if it's all about the monk fruit, but in reality it's actually erythritol in the mix as well as the monk fruit and then some soluble corn fiber to keep things together. It looks familiar enough and this particular pint had a whole lot of cinnamon smell wafting off once I removed the lid. I did risk a few tiny bites and the cinnamon concentration is cranked up pretty high. It's not quite fireball level but it has a good amount of bite to it. 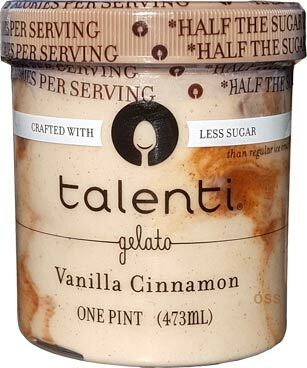 This definitely isn't going for tame or sweet, but there's a good chance it is trying to distract you from the difference between it and a regular pint of Talenti. So, are you excited for these new, lower cal gelatos? 2019 Update: Lemon Bar is being added to this line up. Foot Note: I keep my complete numbered list of Talenti flavors here. I would not say I’m excited to try them. But I will try them. I don’t have any issues with the sugar alcohol like I know you do. However all the low cal ice creams leave me unimpressed. I’m going to be trying harder to curb my overall sugar consumption because the older we get the more sugar destroys us. For that reason I will try these. And it’s Ok if I’m disappointed because I expect to be. Who knows, they may be decent! But I will *always* find a way to fit a twice a week little scoop of the premium stuff into my life. 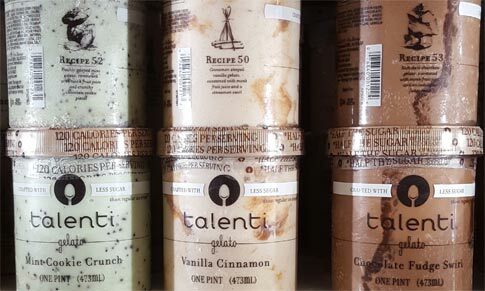 It is still Talenti so it's definitely worth it to at least pick up one of the low cal flavors to give it a try. Unfortunately I cant do a full serving test, but I just took a few more small bites and it seems to break down to more of a water vibe than a milk vibe. Hopefully people will find this soon so they can give the rest of us some hands on feedback. I got the feeling that low calorie pints will become a new trend. Trader Joe's might come out with their line of low calorie pints. I'm going to skip these most likely. I was really into Halo Top and Low Cow for a while but have now gone back to regular ice cream. Just not really worth eating fewer calories if I'm not enjoying them. I hope this trend dies soon. Happy New Year Dubba to you and your family. Also, a very Happy New Year to Nick and his family as well. Are there any of these type of low-cal/protein ice creams that do not use erythritol as a sweetener? My stomach goes into implosion mode when consumed. @aleksandr: there's always been some kind of low cal option for as long as I can remember, so to be more specific you want to say that sugar replacement is the current trend (sorry, not trying to seem like a know it all). @anon: yeah, I would rather save calories by eating main stream ice cream versus super premium ice cream. I have no urge to mess with my system further. @anon2: well we talked about Revele Whipped "gelato" the other day but in general most of the new trend focuses on erythritol and his friends. All they have is artificial ingredients! Have you seen the ingredients in any of these Halo Top type products? 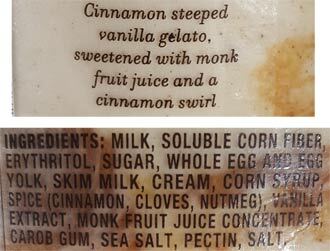 Is erythritol a normal ingredient in ice cream? Is soluble corn fiber? Is carob gum normal? These things are a melange of artificial junk and they are not ice cream. Sugar, milk, eggs, cream. That is what ice cream is. This is some frankenfood processed fake out. @D (who was responding to Lb): technically Halo Top can still claim to be "all natural" which I find amusing but it is what it is. Erythritol is not a normal ingredient in true ice cream, it's only found in "healthy" ice cream (aka they replace regular sugar with something that is sweet like sugar but doesn't have the calories). It's this generations saccharin. @Anonymous I recently tried the ProYo High Protein Coconut Low Fat Ice Cream and liked it a lot (but that could be I just really love coconut) and that uses Xylitol I'm not sure if those with a sensitivity to erythritol would find that less problematic. In fact, none of the products: Halo Top, Enlightened, Breyers Delights are ice cream. There is a standard of identity for ice cream and NONE of these products fit the standard. Practically speaking, these are all frozen desserts. 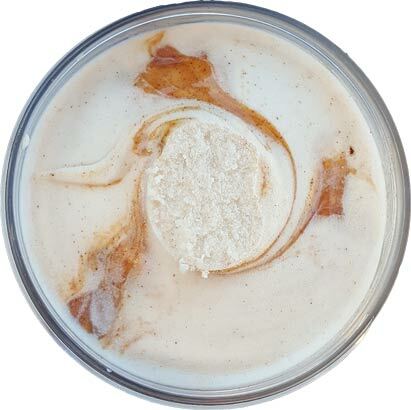 Ice cream is not a product anyone eats to "get healthy" Its an indulgence. You want high fat, low overrun ice cream; buy B&J's or Haagen Dazs. After eating that pint go for a good long run or bike ride. Not into "working it off" then you now have tons of choices to park on your couch and do nothing but eat the whole pint. Ethyritol is a natural ingredient. It is a sugar alcohol. Saccharin is bad for you..ethyritol may cause GI distress in some but more the most part is completely safe. You can try increasing probiotic and taking a digestive enzyme to help with the sugar alcohol effects. When will THIS come into stores? Ethyritol is much better for your body than 30grams of sugar. Ethyritol is not artificial, it is completely safe. Corn fiber and carob gum are used as thickened and are not artificial. Tried the Vanilla/Cinnamon yesterday. Flavor was great, well balanced, but the "ice cream" seemed very watery, almost like I was eating an Italian ice. So by itself, I wouldn't recommend it, if you use it to top a warmed up Fiber One cinnamon coffee cake (which I did), it's perfect! where is everybody finding this? my target doesn't have it yet. Thanks! !